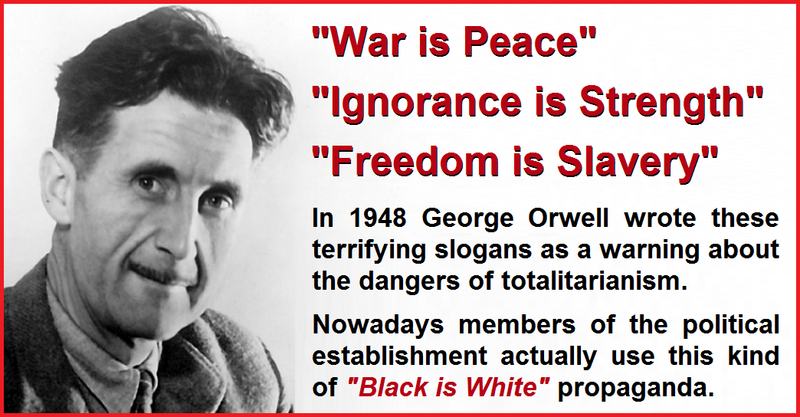 When George Orwell wrote the phrases "War is Peace", "Ignorance is Strength" and "Freedom is Slavery" he intended them as a warning about the dangers of totalitarianism. Nowadays examples of this kind of "Black is White" Orwellian propaganda are alarmingly commonplace in establishment political discourse. In the wake of Theresa May's woeful January 2017 Brexit speech the right-wing propaganda rags went into overdrive to try to convince the gullible that her rhetoric laden speech was some kind of triumph rather than an excruciatingly embarrassing low point in British diplomatic history, utilising a load of Orwellian "Black is White" propaganda in the process. May's speech sent the excruciatingly weak diplomatic message that unless our 27 former European allies cave into her pro-corporate demands, then she's going to turn the UK into a vast bargain basement corporate tax haven, and then they'll be sorry. Resorting to such ludicrous threats before the negotiations have even begun was bad enough, but Boris Johnson (who is somehow Britain's top diplomat) followed it up by insulting the people we're going to have to negotiate with by comparing them to brutal Second World War prison camp guards. The Express somehow twisted this Tory idiocy around completely in order to paint the ones making ludicrous threats and insulting people as the poor innocent victims, and the targets of these threats and insults as the terrible foreign bullies! When it comes to "Black is White" propaganda narratives The S*n went even further by trying to paint Theresa May (the leader of the millionaire-financed party of wealth and power) as some kind of anti-establishment hero intent on "ripping up the privileges of the elite"! The attempt by the Murdoch press to twist Theresa May's "give our major corporations special privileges or we'll turn ourselves into a tax haven" threats into some kind of heroic anti-establishment stance on behalf of ordinary British people is an utterly absurd example of Orwellian propaganda, but it's hardly unusual these days. In fact it's possible to find examples of establishment politicians actually arguing the three Orwellian slogans "War is Peace", "Ignorance is Strength" and "Freedom is Slavery"! Anti-intellectualism is of fundamental importance to any extremist political ideology because extremist ideologies cannot tolerate dissent, thus the importance of attacking and demeaning anyone with the critical faculties to subject the prevailing political ideology to any kind of intellectual scrutiny. The Brexit campaigner Michael Gove exemplified this anti-intellectual "Ignorance is Strength" stance when he said that British people have "had enough of experts" when challenged to name some economic experts who actually thought that Brexit would actually be a good idea. It's obviously no surprise that the man who vandalised our education system and filled our schools with totally unqualified teachers is an anti-intellectual who thinks people should make important political decisions based on ignorance and gut instinct rather than careful considered analysis of what the experts say. Nobody would expect anything else from him because there's no coherent argument in favour of this shambolic "let's make it up as we go along" Tory version of Brexit. If there had've been an actual Brexit plan then it could have been subjected to intellectual scrutiny, but since there was no other plan apart from "let's all vote for Brexit and then let the hard-right of the Tory party make it up as they go along to suit their own interests", criticism and belittlement of critical expert opinion was absolutely vital for the success of the Leave campaign. In January 2014 the former Work and Pensions minister Iain Duncan Smith gave an extraordinarily narcissistic and self-aggrandising speech in which he claimed that his welfare reforms were the modern day equivalent of the abolition of slavery! One of the most absurd things about this ludicrous claim is that one of Iain Duncan Smith's flagship welfare reforms was a massive expansion in the modern-slavery Workfare system. Under numerous Tory workfare schemes hundreds of thousands of unemployed people were stripped of their labour rights and compelled, under the threat of absolute destitution via sanctions, to work for no wages, often at highly profitable corporations. Just imagine the scenario that you've worked your entire life since leaving school at 16, paying National Insurance contributions throughout your working life. Now you're 60 and you've lost your job. But instead of being allowed to access the unemployment benefits you've earned through your decades of National Insurance contributions, the Tory government has told you that you won't get a penny of it unless you complete a Workfare sentence of 30 hours a week of menial labour at Poundland for six months (significantly more hours of unpaid labour than the maximum community sentence handed out to actual criminals). Faced with the prospect of absolute destitution you decide to do your sentence of unpaid forced labour at Poundland where you find that your boss is some jumped up Express-reading Tory fanboy who is less than half your age and considers you to be the kind of idle workshy scum Express columnists have indocrtinated him to hate, and treats you accordingly. No matter how much verbal abuse this disgusting Tory oik slings at you, no mater how much he demeans you in front of the other staff and the customers, you can't quit, because if you quit you know you'll be punished with benefit sanctions. You get no sympathy at all from the other staff at Poundland. They understand the threat you represent to their jobs. Why would Poundland keep paying them actual salaries when they could just sack as many of them as possible to be replaced with an endless supply of free workfare slaves like you. The problem for the other staff members is that their employers and the Tory government are colluding to replace their paid jobs with forced unpaid labour, but you're the physical embodiment of the problem, so they hate you for it. But you can't quit otherwise you get thrown into absolute destitution. During his tenure at the DWP Iain Duncan Smith forced hundreds of thousands of people into situations like this, yet he actually patted himself on the back for it, and even compared himself to the slavery abolitionists of the 19th Century, which is an astoundingly brazen attempt to equate "Slavery" and "Freedom". During the siege of Aleppo a number of Tory revisionists attempted to create the narrative that David Cameron's failed rush to war in 2013 was some kind of glorious missed opportunity. Their argument was that had Cameron had his way, Assad would have been defeated, Aleppo wouldn't be happening, and Syria would probably have become a wonderful bed of roses by now. The reality of course is that the destruction of the Assad regime in 2013 would have created an incredibly dangerous power vacuum, which would likely have been filled by ISIS, just like they filled the power vacuum in Iraq after our catastrophic intervention there. Of course the ongoing civil war in Syria is appalling, but anyone who thinks that David Cameron handing the keys to Damascus to ISIS would have made the situation better than it is now, really is clearly preaching from the bonkers "War is Peace" handbook. Another example of this ludicrous "War is Peace" rhetoric is the Tory justification for continuing to arm Saudi Arabia despite their ongoing war crimes in Yemen, and the fact that over 2,000 Saudis are enforcing the savage ISIS caliphate in Syria and Iraq. "We need to sell them £billions worth of weapons because they're helping us with the war on terrorism" the Tories plead, even when the proof of Saudi weapons, finance and fighters in ISIS have been proven time and time again. The Tories would have us believe that "War is Peace"; that Saudi Arabia is not a vile Islamist regime that has been spreading terrorism and Salafi extremism throughout the middle east and the world for decades, but actually a wonderful global peacemaker! It's considered rather trite to exclaim that "George Orwell's 1984 was intended as a warning, not a political handbook", but the regularity with which members of the political establishment actually try to argue that "Black is White" these days is pretty alarming stuff that Orwell would surely be criticising and satirising if he were still alive today.